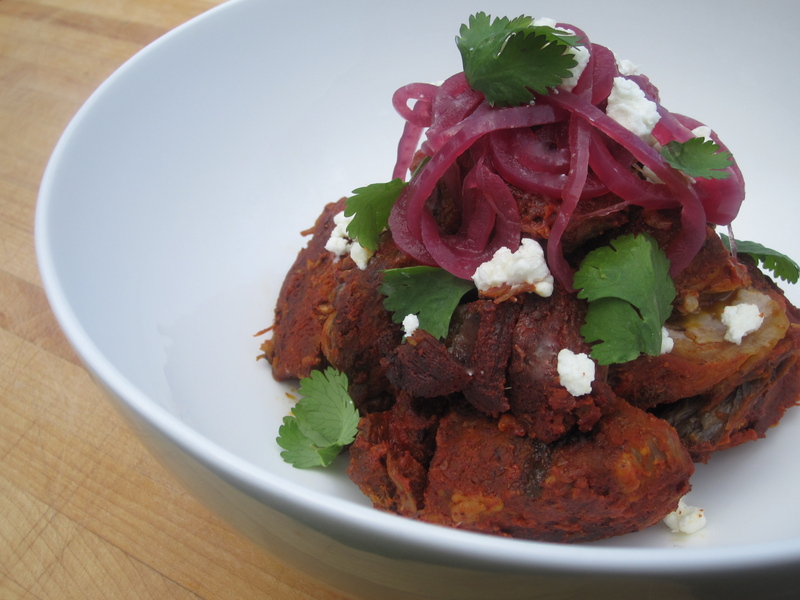 Cochinita Pibil is a traditional preparation for pork with origins in Mexico’s picturesque Yucatan Peninsula. 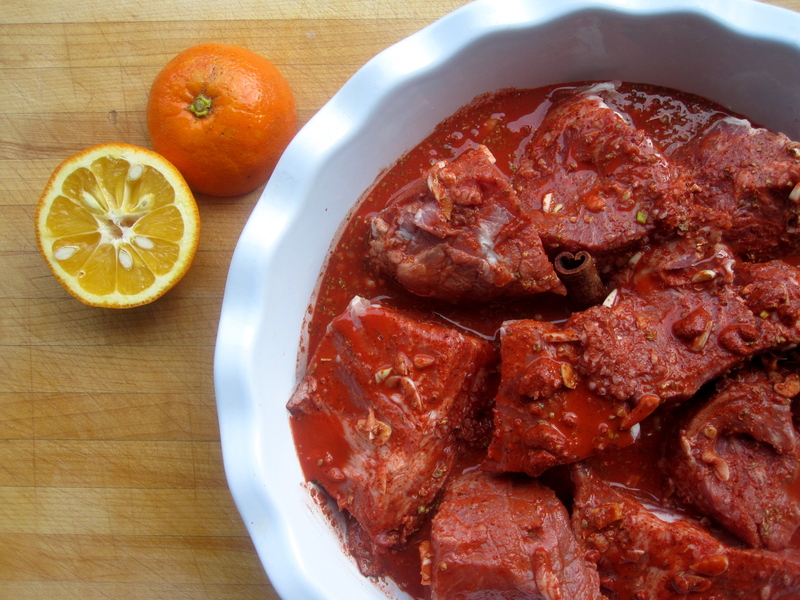 In this version, big hunks of pork shoulder are marinated in fresh, sour orange juice and crushed achiote seeds and then wrapped in aromatic banana leaves. The dish is traditionally pit roasted, and while I would have loved to have made my version totally authentic, I doubt my landlords would have appreciated a giant hole in the backyard. As an alternative, I baked my pork in a moderately hot oven for about three hours and it came out perfectly. A grill with a temperature gauge would make a great (and perhaps slightly more authentic) option. Just do your best to keep the temp. at around 325 degrees. Be sure to make a batch of these pickled onions while the pork is roasting. They’re so simple and they make a great addition to this dish as well as many others, including my all-time favorite recipe from the blog, Chorizo Jibaritos. *If you cant find Seville or other sour oranges, substitute half fresh squeezed orange and half fresh-squeezed lime juice. Preheat the oven to 325 degrees. Cut pork into chunks and place into a large bowl. In a second small bowl, whisk together the crumbled achiote and orange juice until well combined. Add the garlic, oregano, cinnamon, and salt and mix again to incorporate the spices. Pour the spice mixture over the meat and toss together gently to coat all of the meat. Be sure to wash your hands immediately – the achiote will stain your fingers. Open the package of banana leaves and gently unfold them. Each leaf has one long edge with a tough, brown rib that must be removed. Using scissors, carefully cut these ribs from the leaves trying not to tear them. Choose an oven proof baking dish large enough to hold all of the marinated pork easily (I used a 9 x 13 ceramic dish). 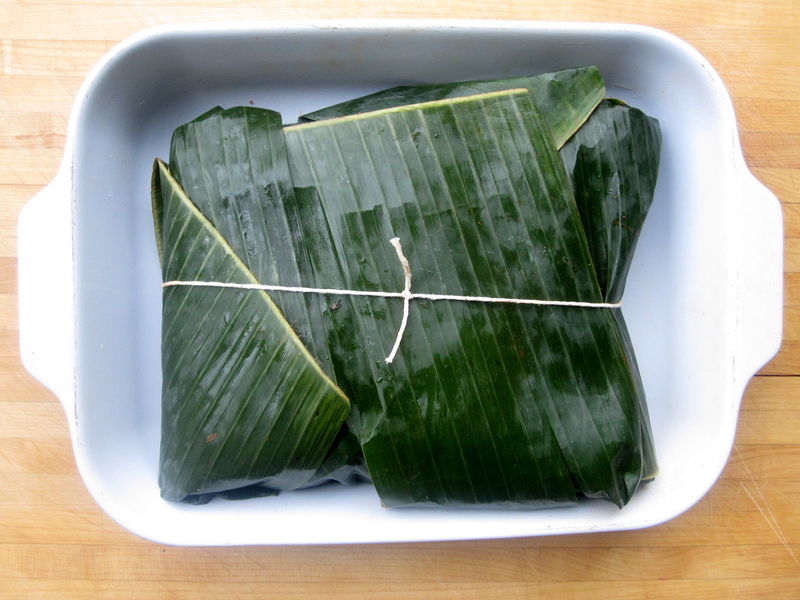 Lay 7 or 8 banana leaves across the dish, in various overlapping patterns, to make a sturdy bed for the pork. It’s important that there is nowhere for the marinade to escape, so be sure to layer carefully over any tears in the leaves. Be sure to leave enough of the leaves overhanging the dish so that the top can be covered before baking. Pour the pork and all of the marinade into the center of the leaves, and then gently fold the outer edges in to cover the meat, tucking them in on the opposite sides of the pan. You may want to tie the package off with some twine (see below), but it’s not totally necessary. Place the pork into the oven and bake for 3 – 3 1/2 hours. When the dish is done, the banana leaves will become toasted and brittle, and the pork will become meltingly tender. Serve the Cochinita Pibil with crumbled queso fresco, fresh cilantro, pickled onions (recipe below), and fresh corn tortillas, if desired. In a small saucepan, bring the vinegar, water, and spices to a boil over medium heat. Add the sliced onion stirring and turning the slices often until they have softened enough to be fully submerged in the vinegar. Cover the pot and turn off the heat. 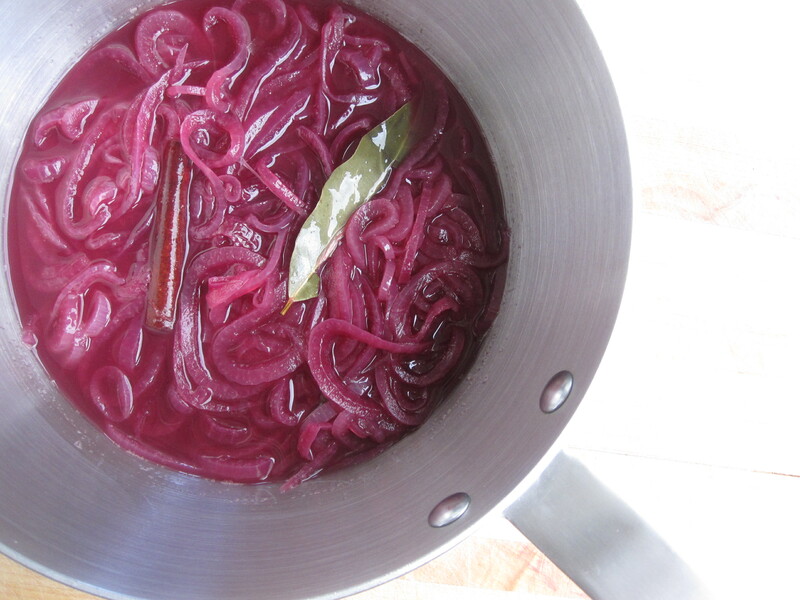 Allow the onions to sit in the liquid for at least one hour and then transfer to a pint jar with all of the liquid. Store in the refrigerator for up to two weeks. This entry was posted in gluten free, paleo, perfect health diet, pork and tagged banana leaves, cochinita, gluten free, mexican, paleo, perfect health diet, pibil, pork, yucatecan. Bookmark the permalink. Enter your email address to be notified when I post a new recipe.